Ideally, you should be thinking about building an audience months (or years) ahead of publication. Audiences grow based on trust–trust that you’re a real person, trust that you’re going to deliver on the promise of good storytelling. Once you’ve got a few folks to trust your work, they’ll work to build trust in their circles, and it snowballs from there. For those at the very start of the ultra-marathon, we’ve put together some tips to help you get that all-important base. We’ll repeat that it’s much easier to build a following for a book once you have a following as an author, but if you’re like most self-pubbed authors, you’ll have book first. Online, it’s about the same. 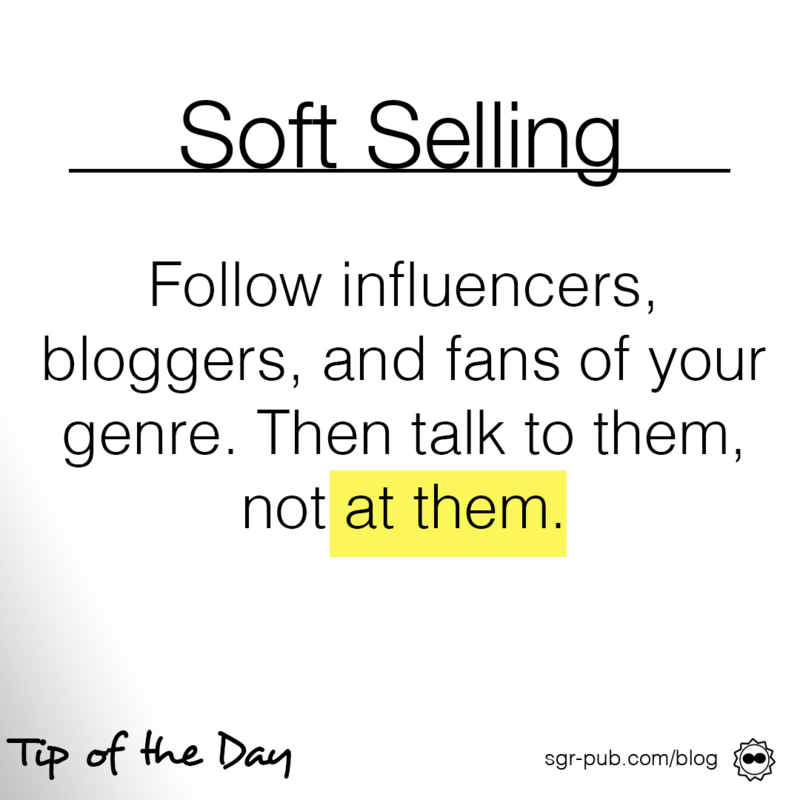 Soft selling is the art of building relationships (trust) first, and then selling later. Many times, folks that follow our alter-ego online have never read her book, but they like what she’s putting out. Eventually, when there’s a sale, they’ll purchase and read. Then, they move from casual fan to involved fan and go on to purchase more. Soft selling doesn’t happen overnight. Effective frequency is the number of times a consumer must be exposed to an advertising message for them to take the desired action. The average person is exposed to ads 362 times per day. There are also over one million books published every year. Now that we know how to sell, it’s time to find people to build relationships with. A good place to start is with other authors. For some, this seems counter-intuitive. Why would you want to partner with your competition? But bookselling isn’t a zero-sum game. Partnering with others in your same genre will help find readers who are more willing to take a chance on an unknown author. And that’s key to understand: Not everyone will read a self-published book, especially by someone without any brand recognition. Where do you find fellow authors? Goodreads groups are where our alter-ego, S. Usher Evans began, followed by Facebook groups. You can follow successful authors in your genre, too, if only to see how they interact with their readers. When they ask questions, answer. When they post something, reply with something real and constructive. Eventually, they’ll see you and remember who you are. Do that enough times and with enough real human interest, and they might even feel comfortable enough to give you a follow*. Once they start seeing your content more, they might be interested enough to buy, read, and there you go. *Don’t pester people to follow you. Especially if someone is an author of some renown, keeping their following to those they like and trust is essential to their online safety. Once you’ve developed a nice contingent of folks who know you, trust you, and, even better, have read what you’ve put out, then the trick becomes having them soft sell for you. Ideally, this happens naturally. When people ask for a recommendation, your book is on the forefront of their mind, and they’ll tell their friends about it. It may take a few months or years to reach this point, however, so be patient. The other, best way to have others sell your book for you is to garner reviews. Next week, we’ll talk about ways you can clear that hurdle.